siti sicuri per comprare viagra generico 25 mg pagamento online a Parma Welcome to the go site Stars Hollow Gazette‘s Health and Fitness News weekly diary. It will publish on Saturday afternoon and be open for discussion about health related issues including diet, exercise, health and health care issues, as well as, tips on what you can do when there is a medical emergency. Also an opportunity to share and exchange your favorite healthy recipes. You can now find past source site source Health and Fitness News diaries here. Tomato season is here. Besides the classic all-American BLT, here are some great recipes to use those tasty orbs during these sultry Summer days. Some version of tomatoes on toast — a juicy American B.L.T. 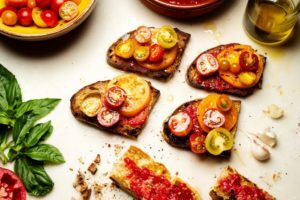 or Italian tomato-topped bruschetta — is always a good idea, but that’s especially true during high summer, when tomatoes are at their peak. One superior combination comes from Barcelona, where a slice of toast is rubbed with garlic and juicy ripe tomatoes, then anointed with olive oil. A simple mixture of bread crumbs and herbs is all you need to make these Provençal baked stuffed tomatoes. Serve them with nearly any summer meal, even for breakfast, alongside fried eggs. This classic summer dish doesn’t get any simpler or more delicious. Use different-colored heirloom tomatoes for the prettiest salad, and buffalo milk mozzarella for the best tasting one. This version has no bread and is a creamy orange-pink rather than a lipstick red. That is because a large quantity of olive oil is required for making delicious gazpacho, rather than take-it-or-leave it gazpacho. The emulsion of red tomato juice, palest green cucumber juice and golden olive oil produces the right color and a smooth, almost fluffy texture. Sweet, ripe summer tomatoes, salt and olive oil are all you need. The flourishes here — green pepper, red onion, chopped mint and pinch of oregano — are optional, but they add brightness. Good Greek feta cheese takes it over the top.